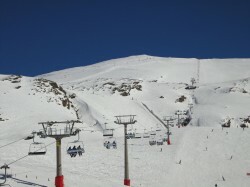 The Sierra Nevada, which means “snowy range” in Spanish, is a mountain range in the region of Andalusia, provinces of Granada and Almería in Spain. It contains the highest point of continental Spain, Mulhacén at 3478 m (11,411 ft.) above sea level. 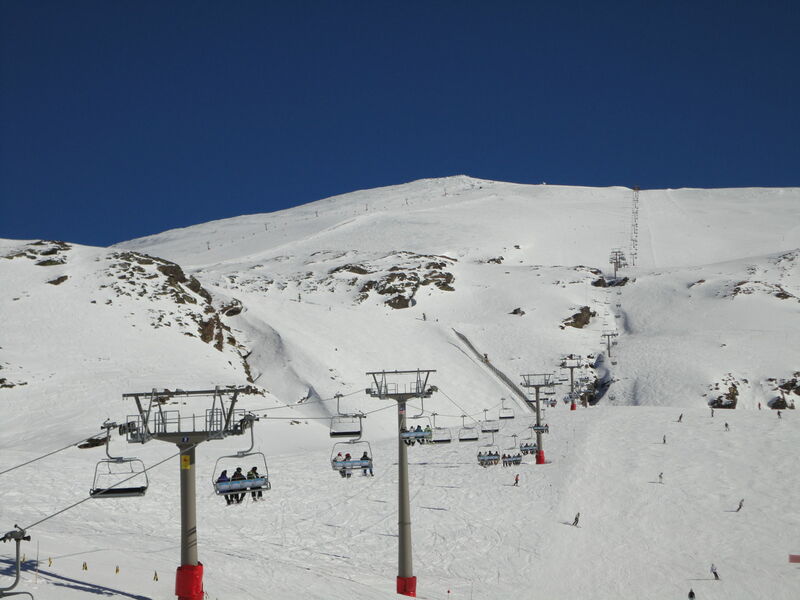 It is a popular tourist destination, as its high peaks make skiing possible in one of Europe’s most southerly ski resorts, in an area along the Mediterranean Sea predominantly known for its warm temperatures and abundant sunshine. At its foothills is found the city of Granada and, a little further, Almería and Málaga. Parts of the range have been included in the Sierra Nevada National Park. The range has also been declared a biosphere reserve. The Sierra Nevada Observatory is located on the northern slopes at an elevation of 2800 m (9186 ft.). The Sierra Nevada was formed during the Alpine Orogeny, a mountain-building event that also formed the European Alps to the east and the Atlas Mountains of northern Africa across the Mediterranean Sea to the south. The Sierra as observed today formed during the Tertiary Period (65 to 1.8 million years ago) from the collision of the African and Eurasian continental plates. Central to the mountain range is a ridge running broadly west-south-west – east-north-east. For a substantial distance, the watershed stays consistently above 3000 m (9842 ft.). On the southern side of the range, several long but narrow river valleys lead off towards the south-west, separated by a number of subsidiary ridges. On the steeper and craggier northern side, the valleys have less regular orientations. This side is dominated by the Rio Genil which starts near Mulhacén and into which many of the other rivers flow. Sierra Nevada is perfect for the whole family, lots of good shoes for the kids and several advanced for the pros. We drive up to the Sierra Nevada so often as we can throughout the winter. I have always wanted to visit Spain. I didn’t even know that there was good skiing there.